The Original immediate Eye-Lid lifting for droopy eyelids – without surgery! The skin-friendly silicone eyelid correction patches restore a fresh, radiant look and overall younger appearance within seconds. This little secret of many stars, introduced to European customers by Makeup Artist Natalie Franz, is suitable for both men and women of all ages. As each eye is different there are no general rules as to where to place the stripe accurately. It is also difficult to tell which size (S or M) is the best. General advice is that small stripes are best for normal, sagging eyes and large stripes are more suitable for drooping eyelids. However, the ideal is to test both versions with your first application and then choose the stripe that gives the best effect. For the first applications you will need some stripes to find the right position. Try to stick the stripe lower, higher, more inwardly or outwardly. Be patient in your testing even if you have difficulties with the application at the beginning. Always use a new stripe on the next attempt. The used stripe can easily be pulled off like a plaster. If you’ve found the best position, you can apply your makeup as usual. 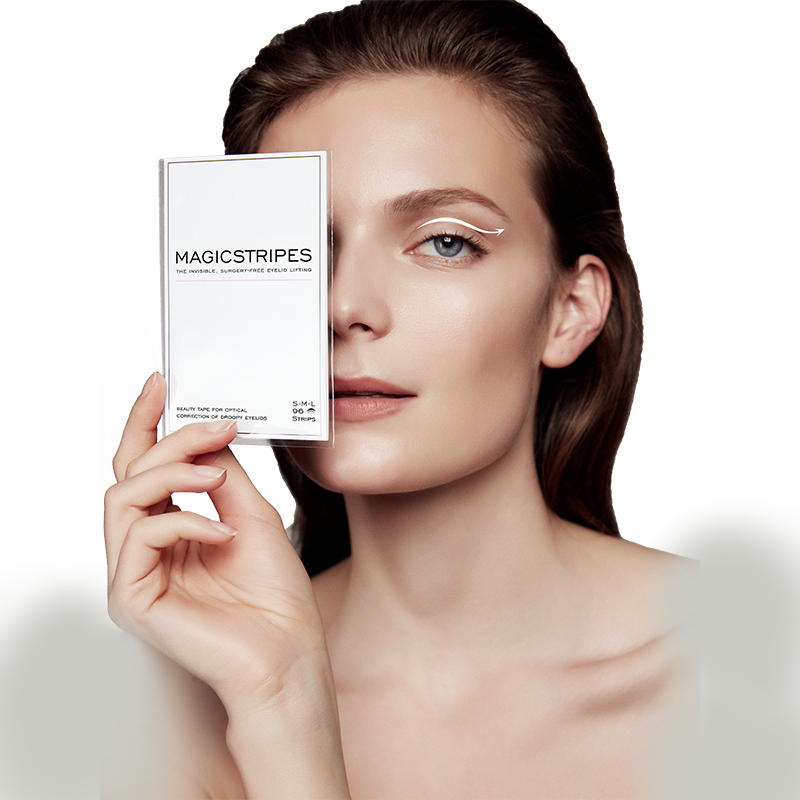 MAGICSTRIPES can be used by persons of all ages, particularly those with tired, small eyes or drooping eyelids can achieve great results! Reduces swelling and has a cooling effect.The MAGICSTRIPES Lifting Collagen Mask is soaked with an effective cocktail of collagen, caffeine, vitamin C, vitamin E, macadamia nut oil and water, which helps to visibly lift, form and tighten the skin of the lower part of the face. Weakening elasticity of the skin causes wrinkles and tired-looking facial features. The lower half of the face – that is, the lateral cheek area, lateral jaw and chin – is a particular problem area. The mask strengthens the skin in the lower half of the face and helps to lift and tighten this area, visibly defining and beautifying the facial contours. The powerful moisturising biological Hydrogel Mask with Hyaluronic Acid consists of highly concentrated high quality essences. The mask has superior effects on skin nutrition supply. It moisturises and relaxes the facial skin and greatly improves its elasticity. The active components respond to the skin’s temperature and are therefore deeply absorbed. The vegetable ingredients are contained much better by the non-woven 100% natural cotton fabric, which is completely biodegradable. The mask makes aged and dry skin firm and moisturised while using the skin’s heat to boost the overall effect. It is enriched with trehalose, a substance that is known to improve the skin’s resistance to climatic changes. The moisturising hand repairing gloves are enriched with natural extracts, active molecules, shea butter and olive oil. They stimulate the skin’s renewal process and help to firm, soften and moisturise it. Age spots are bleached gently. They also reduce the appearance of lines and wrinkles and provide protection against the sun.